Objective : To assess the efficacy and safety of a repeat course of treatment with transdermal nicotine for cessation of smoking in a brief intervention setting. Study design : Randomised, double blind, placebo controlled trial with follow up for 26 weeks. Subjects : 629 smokers who had unsuccessfully attempted to stop smoking by using active transdermal nicotine and brief behavioural counselling. Smokers were motivated to quit smoking for a second time and smoked >/=15 cigarettes a day. Interventions : Twelve weeks' treatment with active transdermal nicotine patches or placebo and brief counselling at monthly visits. Main outcome measure> : Sustained smoking cessation for the 28 days before the visit at week 12 verified by expired carbon monoxide concentrations. Results : At 12 weeks 21/315 (6.7%) subjects allocated to active treatment had stopped smoking compared with 6/314 (1.9%) allocated to placebo (absolute difference 4.7%; 95% confidence interval 1.6% to 7.9%; P=0.003). At 26 weeks the rates were 20/315 (6.4%) and 8/314 (2.6%) (3.8%; 0.6% to 7.0%; P=0.021). Difficulty in sleeping was reported by 43/179 (24.0%) on active treatment and 19/143 (13.3%) on placebo (P=0.015). Severe reactions at the site of application were rare (6/322; 1.9%). Conclusions : Repeated treatment with transdermal nicotine together with brief counselling can improve the low success rates of smoking cessation in recently relapsed, moderate to heavy smokers. Questions remain about whether more intensive interventions or higher doses of nicotine could be more effective. The likelihood of severe reactions at the site of application with repeated treatment is low. Although most smokers relapse after attempting to stop smoking1 and will try again, virtually nothing is known of the efficacy of repeated interventions aimed at smoking cessation. Even when transdermal nicotine had been available for less than one year, 14% of the respondents in a United States survey of methods of smoking cessation had already used it for a previous attempt at giving up.2 Smokers motivated to stop smoking in the near future are more likely to have tried transdermal nicotine than other smokers.3 Thus a substantial proportion of smokers who use transdermal nicotine are probably trying it for a second or subsequent time. The purpose of the AGAIN (another good attempt involving nicotine) study was to assess the efficacy and safety of repeated treatment with transdermal nicotine. The randomised, double blind, placebo controlled study (phase II) evaluated the efficacy of transdermal nicotine in smokers who had relapsed to moderate to heavy smoking after an initial attempt to stop smoking by using active transdermal nicotine (phase I4). The figure shows the design of the study. The behavioural component of the intervention consisted of five to 10 minutes of counselling at each visit4 and a booklet containing advice on smoking cessation and instructions for use of the patches. Subjects were randomised to active or placebo patches (Nicotinell TTS, Ciba-Geigy Australia, Pendle Hill, Australia). Treatment consisted of four weeks each of a 30 cm2 patch (active 21 mg/24 hours or placebo 2.7 mg/24 hours), a 20 cm2 patch (active 14 mg/24 hours or placebo 1.8 mg/24 hours), and a 10 cm2 patch (active 7 mg/24 hours or placebo 0.9 mg/24 hours). Each patch was to be used for 24 hours but could be removed before bedtime if persistent insomnia occurred. The study was approved by the ethics review committee of the Alfred Hospital, Melbourne. It was conducted in accordance with the Declaration of Helsinki and with the good clinical research practice guidelines issued by the Australian Department of Community Services and Health.5 Subjects gave informed consent at the start of phase I.
Recruitment—The community recruitment procedure for phase I of the study was published previously in this journal.4 The eligibility of subjects for a second attempt at quitting (phase II) was assessed 17 to 30 weeks after the first quit date (phase I). At the beginning of this period subjects known to be smoking and subjects of uncertain smoking status were contacted by telephone. Smokers who expressed a strong desire to stop smoking again and had relapsed to regular smoking of >/=15 cigarettes a day were eligible. Ineligible smokers were contacted again at monthly intervals and recruited to phase II if they became eligible. Exclusion criteria—The exclusion criteria for subjects were medications that might interfere with symptoms of tobacco withdrawal; pregnancy, lactation, or potential pregnancy; mental or psychiatric illness; symptomatic ischaemic heart disease or cerebrovascular disease within the past three months; alcoholism; active malignancy; major medical disorders; and extensive skin lesions precluding application of patches. Phase II subjects were also excluded if they had experienced adverse reactions to transdermal nicotine that caused permanent discontinuation of treatment during phase I. Subjects were instructed not to use other nicotine products during the study. Randomisation—Treatments were randomly allocated to study numbers by using a 1:1 ratio within blocks of 10. Subjects were assigned numbers sequentially. The packaging and appearance of the two treatments were identical. Follow up—Review at the study centre was scheduled for 4, 8, 12, and 26 weeks after the quit day. Information about adverse experiences was recorded in response to a general question about subjects' health since the last visit. Subjects were telephoned at week 11 to ascertain self reported smoking status and were asked to guess their treatment assignment. Before week 26 subjects were contacted again to check smoking status. Subjects claiming to be abstinent at either follow up point were asked to attend the study centre or offered a home visit. Measurements—Smoking cessation was defined as self reported sustained non-smoking for the 28 days before follow up provided it was confirmed by an expired air carbon monoxide reading of </= 8 ppm at that visit.4 Carbon monoxide testing is effective for deterring inaccurate self reports of non-smoking and is at least 90% sensitive for detecting smoking within the previous 24 hours.6 Relapse was defined as smoking on three or more consecutive days since the last visit or by a carbon monoxide reading >8 ppm. Continuous abstinence was defined as self reported non-smoking from the quit day, verified by attendance at each scheduled visit and by carbon monoxide levels </=8 ppm at each visit. Other smokers were termed “occasional smokers.” Subjects lost to follow up or unavailable for measurement of expired air carbon monoxide were assumed to have relapsed. Analysis—The study was planned with a power of 0.90 (two sided test) for the detection of a difference between the absolute rates of smoking cessation of 10% and 20%, with a significance level of 0.05. This required the recruitment of 530 phase II subjects from an estimated phase I cohort of 1500 subjects. All eligible smokers at the end of phase I were asked to participate in phase II. The efficacy data were analysed on an intention to treat basis. The primary end point was sustained smoking cessation at the end of treatment in phase II (week 12). Secondary end points were smoking cessation at the end of phase II (week 26) and the safety and tolerability of the patches. The proportions of active treatment and placebo at end points were compared by χ2 test or Fisher's exact test. Changes in quantities between two time points were examined by paired t test or McNemar's test as appropriate. Data were analysed by an SAS-PC software program. Results are reported as means (SD) or as percentages (95% confidence intervals). Characteristics of subjects—Phase I of the study recruited 1481 subjects4 from which 629/670 eligible subjects (93.9%) were recruited for phase II. 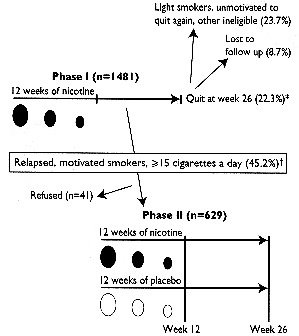 No subjects were excluded from phase I because of the possibility of a second attempt at smoking cessation. The figure shows the status of subjects at the end of phase I. Table I shows characteristics of subjects before each attempt to quit. Compliance—After the first four weeks of treatment with patches of 30 cm2, 152/315 (48%) subjects allocated to active treatment and 124/314 (39%) allocated to placebo continued treatment. After the 20 cm2 patches, 113/315 (36%) and 58/314 (19%) subjects, respectively, continued. The rates of permanent discontinuation of treatment because of adverse experiences were 7/179 (3.9%) and 5/143 (3.5%) subjects, respectively (P=0.919). Smoking cessation—Table II shows the rates of smoking cessation. Overall, 21/315 (6.7%) subjects allocated to active treatment and 6/314 (1.9%) allocated to placebo had ceased smoking at the end of 12 weeks' treatment, representing an absolute difference in success rates of 4.7% (95% confidence interval 1.6% to 7.9%; P=0.003). Cessation rates at week 26 were 20/315 (6.4%) and 8/314 (2.6%), respectively (absolute difference 3.8%; 0.6% to 7.0%; P=0.021). Early relapse—Most subjects allocated to active treatment (298/315; 94.6%) and to placebo (300/314; 95.5%) smoked one or more cigarettes within the first four weeks of quitting or did not return for follow up. Subsequently, smoking cessation at week 26 was documented for 13/298 (4.4%) of these subjects assigned to active patches and 2/300 (0.7%) of those assigned to placebo (P=0.004). If subjects had not smoked at all in the first four weeks, 7/17 (41.2%) assigned to active patches and 6/14 (42.9%) assigned to placebo were still not smoking at week 26 (P=0.786). Adverse effects—Detailed data on safety and tolerability during follow up were available for 179/315 (56.8%) subjects on active treatment and 143/314 (45.5%) on placebo (table III). Most adverse experiences were mild. Reports of reactions at the sites of applications were more common among those using patches who had a similar problem in phase I (previous reaction 23/62 (37.1%) v no previous problem 21/117 (18.0%); P=0.005). This was also true of those on placebo (14/45 (31.1%) v 13/98 (13.3%); P=0.011). Reports of problems with sleeping were more common among those on active treatment who had a similar problem in phase I (previous problem sleeping 23/71 (32.4%) v no previous problem 20/108 (18.5%); P=0.034). This was also true of those on placebo (13/67 (19.4%) v 6/76 (7.9%); P=0.043). Weight gain—There was no effect of treatment on weight gain after smoking cessation. At week 12 the mean (SD) weight gain in subjects who had quit was 1.9 (3.1) kg in both groups. Blinding of treatment assignment—Of the 629 subjects, 573 (91.1%) were able to be contacted regarding blinding. Treatment assignment was guessed correctly by 63/281 (22.4%) of those allocated to active treatment and by 109/272 (38.8%) of those allocated to placebo. This study was primarily designed to assess the efficacy of repeated treatment with transdermal nicotine for moderate to heavy smokers. For this reason the randomised, placebo controlled trial was preceded by a study of active transdermal nicotine of adequate size from which relapsed smokers were recruited. Ninety four per cent of eligible smokers agreed to participate in the second phase. The validity of the results was further strengthened by high rates of follow up in both phases to determine smoking status and by adequate blinding of treatment assignment. The benefits of transdermal nicotine compared with placebo were similar to those in previous reports of first time use in that success rates were approximately doubled by assignment to active treatment.8 This finding contradicts that of an earlier study which reported a zero rate of smoking cessation for repeated treatment with active transdermal nicotine.9 Major differences in design of the two studies explain the discrepancy. The earlier study enrolled a small number of relapsed subjects previously treated with active transdermal nicotine (n=52) without assessment of motivation. Only half of the eligible relapsed smokers were represented, and there was no prospective control group. A very low long term cessation rate in the subjects allocated to placebo in our study (2.6%) indicated that the smokers studied had a low probability of quitting. For comparison, the quit rates for those on placebo from studies of first time use of transdermal nicotine in brief intervention settings range from 4.8% to 9.1%.10 11 12 Although the addition of transdermal nicotine improved the success rate to 6.4%, it is reasonable to assume that more intensive interventions with added treatment components8 could have improved the success rates further. The general acceptability of intensive interventions, however, is doubtful,13 and most relapsed smokers in the community will probably choose to repeat a brief intervention similar to the one studied. Alternative approaches worthy of investigation include higher doses and more rapid delivery of nicotine. Rates of continuous abstinence were close to zero in both groups, indicating that few smokers were able to maintain complete abstinence soon after the quit day (table II). The positive treatment effect, measured by sustained abstinence at week 12 and week 26, supports the hypothesis that transdermal nicotine may function to reduce the reinforcing effects of slip up smoking14 15 in addition to its effects on nicotine withdrawal symptoms. Reactions at the site of application were more common if subjects had experienced a reaction during phase I. This increase, however, may have been due to greater vigilance and reporting by subjects as there was also an increased rate of sleep disturbance among placebo treated subjects who had reported a problem sleeping during phase I. Nevertheless, the rates of severe reactions at the site of application and subsequent withdrawal from treatment during repeated treatment were very low, suggesting that repeated use of transdermal nicotine is not accompanied by a clinically important problem of contact sensitisation. In conclusion, we have shown that relapsed, nicotine dependent smokers who are still motivated to stop smoking can receive important incremental benefits from repeated treatment with transdermal nicotine together with brief counselling. Questions remain about whether more intensive interventions or higher doses of nicotine could improve the relatively low quit rates of relapsed smokers further. The likelihood of severe reactions at the site of application with repeated use of transdermal nicotine is low. The study was completed with the help of a dedicated team of research nurses: Lesley Pearson (deputy coordinator), Christine Woodburn, Janet Wilson, Fiona Williams, Evelyn O'Donnell, Virginia Parker, Sarah Vaughan, Lisa Rowley, Karen McBrearty, Michelle Coleman, and Jillian Baird. Nuala Campbell, Lisa Gould, and Teresa Koczyk provided secretarial assistance. We are grateful to Ciba-Geigy Australia Ltd, which provided the research team with much practical support, particularly concerning case record monitoring. SGG is now a National Heart Foundation of Australia overseas research fellow. Funding Ciba-Geigy Australia, the Anti Cancer Council of Victoria, and the Victorian Health Promotion Foundation. Ciba-Geigy Australia provided the transdermal nicotine patches. Conflict of interest SGG has received research funding from and has been a paid consultant to Ciba-Geigy Australia, manufacturers of transdermal nicotine. DP is medical director of Ciba-Geigy New Zealand. .Methods used to quit smoking in the United States.JAMA1990;263:2760–5. .Characteristics and perceptions of nicotine patch users.J Fam Pract1994;38:459–64. .Nicotine patch use in the general population: results from the 1993 Californian Tobacco Survey.J Natl Cancer Inst1995;87:87–93. .A prospective study of factors predicting smoking cessation using transdermal nicotine therapy.BMJ1994;309:842–6. .Good clinical research practice guidelines. Canberra: Australian Department of Community Services and Health,1991. .Error in smoking measures: effects of interventions on relations of cotinine and carbon monoxide.Am J Public Health1993;83:1251–7. .The effectiveness of the nicotine patch for smoking cessation. A meta-analysis.JAMA1994;271:1940–7. .Recycling with nicotine patches in smoking cessation.Addiction1993;88:533–9. .Clinical experience with a transdermal nicotine system in healthy nicotine-dependent smokers. In: Wilhelmsen L ed.Smoking as a cardiovascular risk factor–new strategies for smoking cessation. New York: Hogrefe and Huber Lewiston,1991: 35–46. .A double-blind trial of a 16-hour transdermal nicotine patch in smoking cessation.N Engl J Med1991;325:311–5. .Dose effects and predictors of outcome in a randomized trial of transdermal nicotine patches in general practice.Addiction1995;90:31–42. .An outline for approaches to smoking cessation: quality assurance project. In: Mattick RP, Baillie A eds.NCADA Monograph No 19. Canberra: Australian Government Publishing Service,1992: 15–50. .Effect of transdermal nicotine patches on cigarette smoking: a double blind crossover study.Psychopharmacology (Berl)1992;106:421–7. .Nicotine skin patch treatment increases abstinence, decreases withdrawal symptoms, and attenuates rewarding effects of smoking.J Clin Psychopharmacol1994;14:41–9.